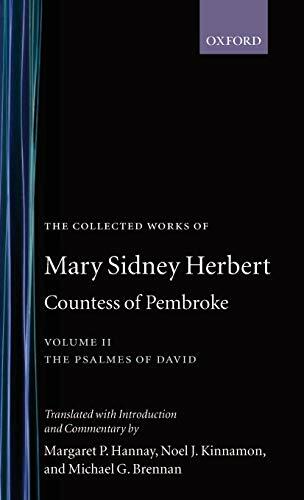 Mary Sidney Herbert, Countess of Pembroke, is the most important Elizabethan woman writer and patron outside the royal family. By astute use of the genres permitted to women, she supported the Protestant cause, introduced continental literary genres, expanded opportunities for later women writers, and influenced seventeenth-century lyric and drama by such writers as John Donne, George Herbert, Mary Wroth, and William Shakespeare. This scholarly edition in two volumes is the first to include all her extant works: Volume I prints her three original poems, the disputed 'Dolefull Lay of Clorinda', her translations from Petrarch, Mornay, and Garnier, and all her known letters. Volume II contains her metrical paraphrases of Psalms 44-150. The edition also provides a biographical introduction, discussion of her sources and methods of composition, textual annotation, and a detailed commentary.